Please your family and guests with a taste experience that is like no other! 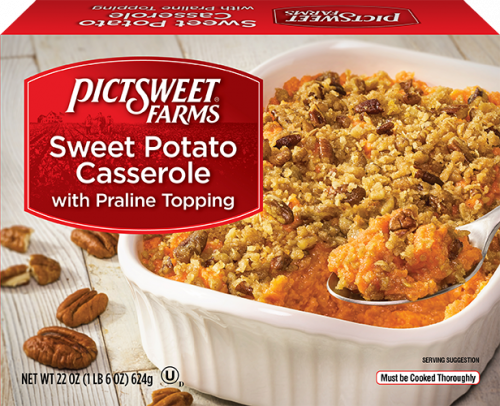 Enjoy Pictsweet Farms Sweet Potato Casserole, featuring delicious farm-fresh sweet potatoes and a sweet praline topping. Everyone will be asking for seconds! REMOVE FROZEN TRAY FROM CARTON. REMOVE WRAPPING FROM TRAY. PLACE frozen casserole tray on a baking sheet on center rack. BAKE for 1 hour 15 minutes or until casserole is thoroughly heated. PLACE frozen casserole tray in microwave. MICROWAVE on HIGH for 13 minutes. REMOVE casserole tray from microwave. Cooking times are based on an 1100 watt microwave. Microwave ovens vary in power. Cooking times are approximate. Sweet Potatoes, Sugar, Liquid Margarine (Liquid and Hydrogenated Soybean Oil, Water, Salt, Vegetable Mono & Diglycerides, Soy Lecithin, Sodium Benzoate (A Preservative), Citric Acid, Natural and Artificial Flavor, Beta Carotene (Color), Vitamin A Palmitate Added, Calcium Disodium EDTA Added to Protect Flavor), Brown Sugar, Enriched Flour (Enriched Bleached Wheat Flour, Malted Barley Flour, Niacin, Reduced Iron, Thiamine Mononitrate, Riboflavin, Folic Acid), Pecans, Non Dairy Creamer (Coconut Oil, Corn Syrup Solids, Sodium Caseinate (A Milk Derivative), Mono and Diglycerides, Dipotassium Phosphate and Sodium Silico Aluminate), Oats, Baking Powder, Cornstarch, Food Starch Modified, Natural and Artificial Flavoring, Salt, Spices. CONTAINS MILK, SOY, WHEAT, TREE NUTS (PECANS).